I need more time! Seriously, how is it October already? I just got back from the US a few weeks ago (at least that's what it feels like...). These last few weeks really flew by, because so much has happened: I moved to Hamburg to get my Masters Degree! So far I really like college, especially the people in my year. I've made some really good friends already and I can't wait to see what the next two years have in stock for us! Anyhow, I made this plum cake twice before I left. 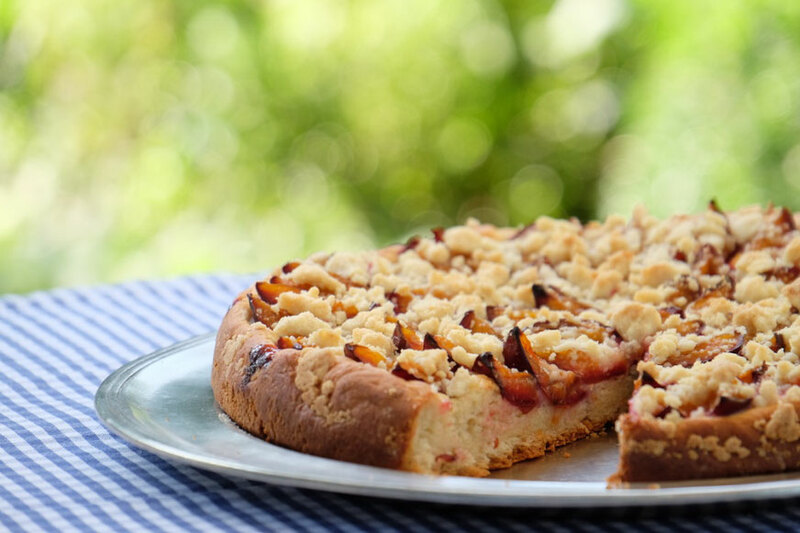 It's a very traditional German cake made with yeast dough. I used to be really intimidated by baking with yeast but I think I'm finally over my fear! As long as keep a few things in mind, nothing can go wrong. And the only way to learn is to try, try and try some more! And here is what I've learned about yeast so far: Yeast is a living organism. I get the best results when I use fresh yeast as opposed to dry yeast. To activate the yeast organisms, you need to give them something to eat (they, just like me, love sugar) and keep them warm and cosy! That's it! If I can do this, so can you. Seriously. Also, I'm pretty sure this cake would taste great even if the dough doesn't turn out so good! 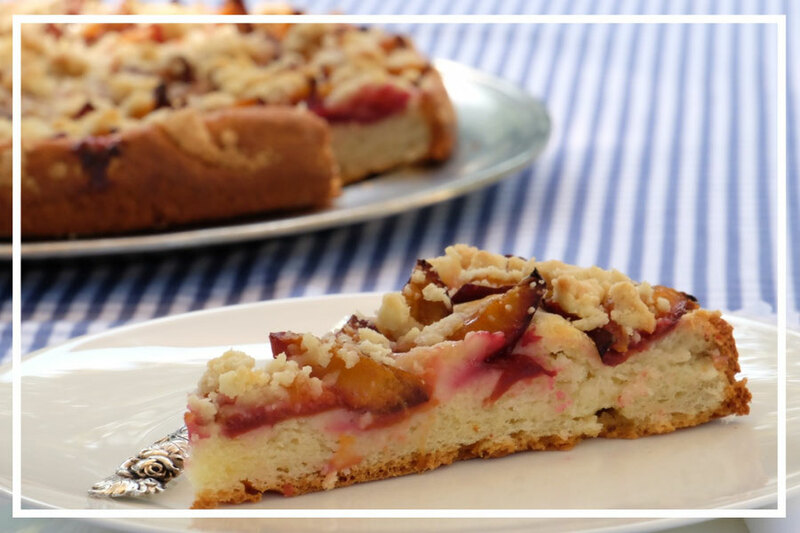 The aromatic plums and the crunchy streusel topping really make this cake something very special. Have a great autumn you guys. Crumble up the yeast and put it into a cup. Add the tablespoon of sugar and the tablespoons of milk and give it a stir. Add the rest of the milk and the butter into a saucepan and put the whole cup with the yeast into the saucepan. Now heat the saucepan over low heat. This will do two things: First, the butter will melt into the milk. Second, the heat from the milk will warm the milk in the cup, which will activate the yeast. The yeast will the produce bubbles and rise (takes about 10 minutes). It's best to turn off the heat after about 3 minutes to prevent the yeast from overheating and dying. If nothing happens to the yeast after more than 20 minutes, it's most likely past its expiration date and you will have to start anew with fresh yeast. In a big bowl, add the buter-milk-mixture, the sugar, the flour, the salt and the egg and knead this for about 10 minutes, either by hand or in a stand mixer. A smooth albeit sticky dough should form, that will slightly pull apart from the sides of the bowl. Don't worry if it seems too wet, that's how it's supposed to be! The dough will dry out a little bit while resting. Cover the bowl with a lint-free, clean kitchen towl and put it somewhere warm and draft-free. I like to put it into my oven or microwave (turned off, of course). The dough needs to rest and rise for at least one hour, but the longer, the better. You could even let this rest in the fridge over night. Add all the ingredients for the streusel into a bowl and knead them together, until a dough ball forms. Only add as much water as you need, as you go along. Put them to the side. Wash the plums and remove the stones. Cut them lengthwise without separating them and cut one slit in each half of the plum, so that you can ''open'' them up and lay them flat on the dough later. Line a spingform pan with baking paper and coat it with non-stick baking spray. Preheat your oven to 180°C degrees. Cover your worksurface and a rolling pin with some flour and roll out the dough. If the dough is too sticky, use some more flour. The dough should be big enough to cover the bottom of the pan. 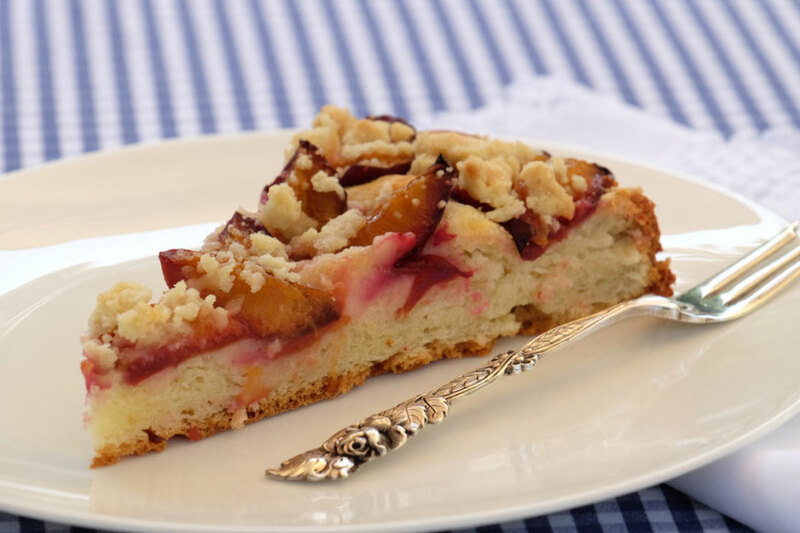 Roll the dough onto the rolling pin and transfer it into the cake pa.
Leave a 1 cm rim on the edge and add the plums, starting on the outside and working your way inside. Crumble the streusel on top. Bake the cake for about 40 minutes, or until the crust and the streusel are golden brown. Hey I am so excited I found your blog page, I really found you by accident, while I was browsing on Google for something else, Anyhow I am here now and would just like to say thanks for a marvelous post and a all round enjoyable blog (I also love the theme/design), I don�t have time to look over it all at the moment but I have book-marked it and also included your RSS feeds, so when I have time I will be back to read more, Please do keep up the excellent work. At this time it sounds like Wordpress is the top blogging platform available right now. (from what I've read) Is that what you're using on your blog?